It’s past 2am on a Monday morning in Paris, and Géoportail is still not giving me maps. I’ve read somewhere (sorry, link lost) that it may take up to a week to muster the necessary resources, and/or that a password system may need to be introduced to limit access. Meanwhile, Alexis Kartmann at Coma Informatique posts a link to the YouTube video of how Géoportail was introduced on the (French) news… The news footage shows a working 2D Géoportail, except that it’s not geoportail.fr, it’s the mapping application for the French yellow pages, made by Mappy, that Alexis has been working on since the start of the year. 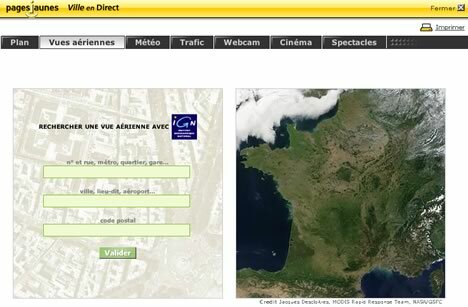 Alexis points out that while the imagery is IGN’s (the French government’s National Geographic Institute), the interface and backend are their own. Yes, that’s right, the French yellow pages (Pages Jaunes, a publicly traded company) has the exact same image dataset as Géoportail, but you can go there now (click on the guy with the magnifying glass) and see all of France at 50cm resolution, with no ifs, ands or buts. Also, it has a cool smooth zooming feature. Ça alors! I hope that the Géoportail will give a better res for the pict than PagesJaunes, the quality is awfull. And I don’t talk about the terrible interface. Please, Mister IGN, give your nice pict to Google. They know how to do and they have enough servers.